Viv has a background in interior design and since her student days, studying Textile Design, she has had a lifelong love of textiles, threads and surface pattern. She is intrigued by the idea of changing the surface of cloth or paper with stitch. Exploring feelings of peace and calm in an often over crowded world, where life is lived at a hectic pace, Viv uses threads and stitches as evidence of time taken for quiet reflection. Working with emulsion paints to give a chalky surface, and oil pastels, she hand stitches into delicate papers and natural fabrics to bring to life the shapes and colours derived from her drawings and mark making studies. 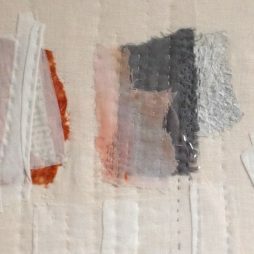 Every one of her hand stitched pieces is a ‘one off’ and cannot be reproduced, although working on a chosen theme, e.g. domestic life, the beach, the seasons, often results in a series of similar pieces. Viv’s work has been shown at Oxmarket Centre of Arts, and Pallant House Gallery in Chichester, and she has taken part in the Chichester Art Trail, as well as exhibiting in Cheshire. She also exhibits regularly in the village of West Wittering, West Sussex, near her home, with the Autumn Affordable Art group of artists, and her work can be seen at.